As our regular readers know, we love talking about books around here, so today we’re sharing a little bit with you about Kathleen Forbes, an Irish-Canadian author who writes poetry, children’s, and young adult books that reflect both her love for her birthplace and for her adopted homeland. Kathleen grew up in Belfast, Northern Ireland, during World War II and immigrated to Canada when she was 18. 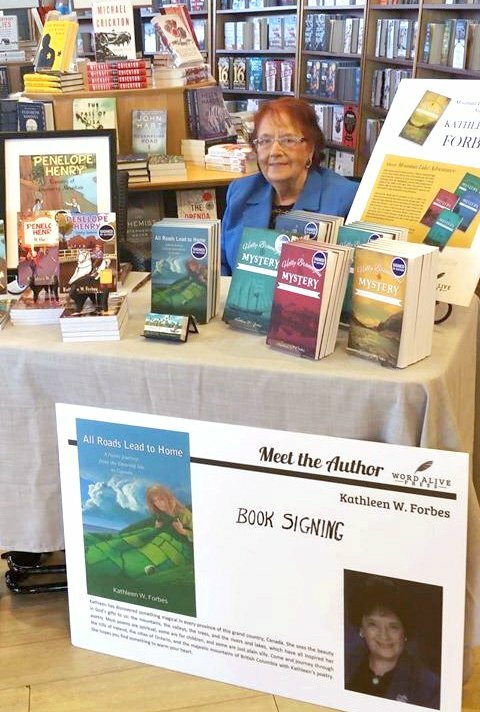 She’s been a storyteller, singer, and poet her entire life, but it wasn’t until her 80s that Kathleen turned her hand to publishing children’s and young adult books. Now at 88 years of age, this mother of three, grandmother of seven, and great-grandmother of nine has nine books (so far) under her belt! And what a life she’s had! From prospecting for gold to chuckwagon racing, from teaching ballroom dancing to performing as a movie extra and in community theatre, Kathleen has always lived life to the fullest. She’s lived and travelled all through Canada and currently calls Irricana, Alberta home. Every story she writes contains tiny snippets of her rich life history. For example, Kathleen’s family reunions on a Saskatchewan farm were the inspiration to write Penelope Henry: Country Jamboree, and the spunky protagonist in Kathleen’s Holly Brannigan series is named after her own daughter, Holly. My mother used to feel so tall to me, and she still seems so today even at her stature of 5’2″. She was an outrider in a chuckwagon race in her first year of marriage. She used to make our dresses with matching coats. She hosted an exercise program on TV when I was 5, and she taught ballroom dancing for the Arthur Murray Dance Studio. She’s a novelist, a poet, a songwriter and singer, and at 88 years old she’s still writing with 9 books published, one in her head and one more ready to be picked up by the next willing publisher. Her motto is, “You’re not done till you’re done,” and Kathleen Forbes is still teaching me to this day. 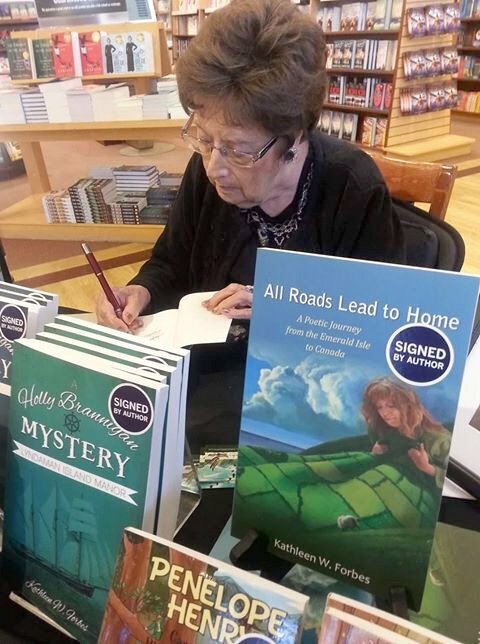 Kathleen’s published books include the Penelope Henry series, Holly Brannigan Mysteries, and a book of poetry, All Roads Lead to Home. 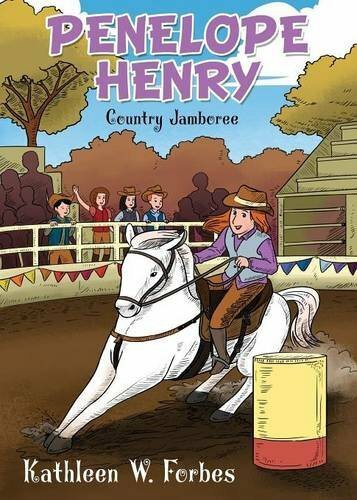 Country Jamboree is the third and latest installment in Kathleen’s series of middle school books featuring nine-year-old Penelope Henry, her brother Zinger, and Dinty Finnigan, a leprechaun who serves as the children’s friend and protector. It’s not necessary to have read the previous books, but the characters do make several references to their past adventures together. When Penelope and her family and friends are invited to their cousins’ country farm for a giant family reunion, they find all the fun activities you would expect like horse racing, trick riding, and lariat twirling, plus a few other things you wouldn’t! Alongside the country fun, the kids and Dinty find an injured boy and help a family find a new home. Country Jamboree reminds me of the stories my father would tell me as a kid. There’s a old-timey feel, similar to the Enid Blyton and Arthur Ransome books I read as a child. Kathleen’s conversational style of storytelling is warm and unhurried, good for reading aloud together before bed. 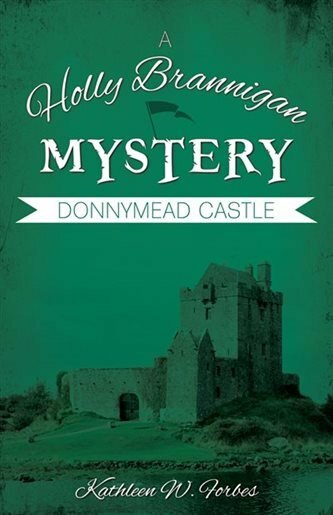 Donnymead Castle is the first book in the Holly Brannigan Mysteries series. Named after Kathleen’s own daughter, Holly is a plucky 15-year-old from Vancouver, Canada with a nose for trouble. When Holly and her mother visit Holly’s grandmother in the small Irish village of Donnymead, Holly is immediately drawn to majestic Donnymead Castle up on the hill. After meeting a mysterious fortune teller who seems to know more than she’s telling, Holly finds herself swept up in an adventure involving sinister strangers, secret passageways, and an international crime ring. When Holly and her friend Tim are captured by a trio of ruthless gunrunners, they are rescued by a wanderer with unexpected ties to Donnymead Castle’s tragic past. Holly is a kind, intrepid, and likable heroine, and this young adult short novel is well-paced and packed full of history, mystery, and danger. Note that the author uses the term “gypsy” throughout the book to refer to a group of Travellers camping in the nearby woods so a discussion would be warranted with your teenager around the historical and perjorative use of this word. Win a Kathleen W. Forbes Book! One of my readers will win their choice of either of the books we reviewed here. Enter in the giveaway widget below. This giveaway is open to residents of Canada and the US, 18+. All the winner’s entries will be verified. Disclosure: I received sample items to facilitate this review. All opinions expressed are completely honest and my own, based on my personal experience. Your experience may differ. This post contains affiliate links. 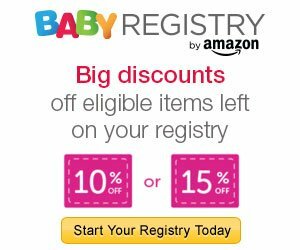 As an Amazon Associate I earn from qualifying purchases, at no additional cost to you. Let the kids pick the books. I always try to teach by example they see me reading and they want to read with me. Go to the library at a young age. Lead by example. They see you enjoying yourself by reading a book, they’ll want to do the same. To encourage our tween boy to read we got him a bunch of Guiness Record books, particularly the video game edition and the gross-out edition. We try to buy him books that also have a little something to do with his other interests, mainly gaming. I personally read (I’ve read 32 books this yr) and I think when your child sees YOU reading, they want to imitate you and will read as well (my daughter actually works for indigo warehouse now). I now gift books instead of the cards for baby showers as well I give books to my niece and nephew. We cuddle up on the couch together to read books I carefully select for them (based on their interests). We always read books before bed, or curl up on the couch and read some books. 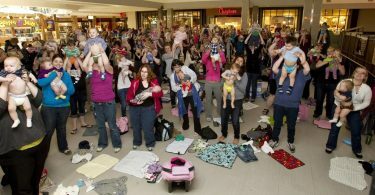 We model our love of reading and have read to our children d from the time they were babies. There are so many different ways to encourage kids to read. I’ve always loved reading with my kids and grandkids. It’s important to make it fun. Sometimes I ask if they want to read the book to me. Even though the little ones can’t actually read, they seem to enjoy that. We also read favorites as many times as they want to the point that they start to memorize them! 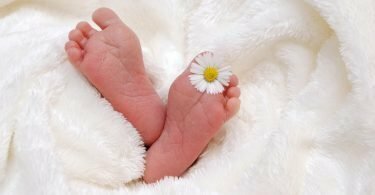 If I had a child, I would encourage the child to read at a young age and try to minimize usage of computer unless it is for educational purposes. Kids love reading book about what they like, for example sport, music, animals or nature. My best tip is to read with your kids. Pick a topic they really like, read a little just before bed to them and they will be into it! Let them see how much you love reading too! My best tip is to put aside a together reading time. We all read a book at the same time and then they tell me about what they have read over milk and cookies. It is a special time of day for all of us. I show them reading can be fun and read stories to them and spend time with them. My tip is to read with your child. I like to take my son to Value Village or a used book store and let him pick any 2 or 3 books he likes. They’re not expensive so he can pick anything and lots of time we find hidden treasures.